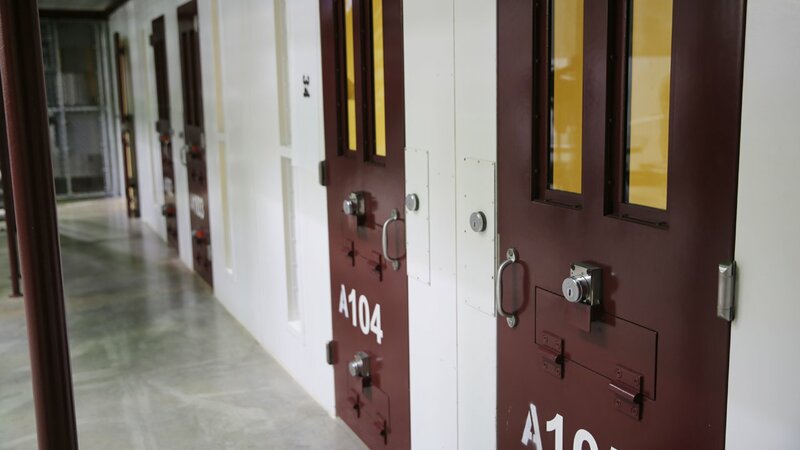 WASHINGTON -- President Barack Obama on Tuesday proposed to "once and for all" close the detention center at Guantanamo Bay, Cuba, and transfer remaining detainees to a facility in the U.S., though his plan does not specify where. "I don't want to pass this problem on the next president, whoever it is. Are we going to let this linger on for another 15 years?" he said, in an appearance at the White House. "Keeping this facility open is contrary to our values. It undermines our standing in the world. It is viewed as a stain on our broader record of upholding the highest standards of rule of law." Obama's proposal ducks the thorny question of where the new facility would be located and whether Obama could complete the closure before he leaves office. The plan, which was requested by Congress, makes a financial argument for closing the controversial detention center. U.S. officials say it calls for up to $475 million in construction costs that would ultimately be offset by as much as $180 million per year in operating cost savings. The proposal is part of Obama's last effort to make good on his unfulfilled 2008 campaign vow to close Guantanamo and persuade lawmakers to allow the Defense Department to move nearly 60 detainees to the U.S. But with few specifics, the proposal may only further antagonize lawmakers who have repeatedly passed legislation banning any effort to move detainees to the U.S.
Obama, meanwhile, planned to make a midmorning statement on Guantanamo at the White House. U.S. officials say the plan considers, but does not name, 13 different locations in the U.S., including seven existing prison facilities in Colorado, South Carolina and Kansas, as well as six other locations on current military bases. They say the plan doesn't recommend a preferred site and the cost estimates are meant to provide a starting point for a conversation with Congress. The seven facilities reviewed by a Pentagon assessment team last year were: the U.S. Disciplinary Barracks and Midwest Joint Regional Corrections Facility at Leavenworth, Kansas; the Consolidated Naval Brig, Charleston, South Carolina; the Federal Correctional Complex, which includes the medium, maximum and supermax facilities in Florence, Colorado; and the Colorado State Penitentiary II in Canon City, Colorado, also known as the Centennial Correctional Facility. According to the officials, the U.S. facilities would cost between $265 million and $305 million to operate each year. The annual operating cost for Guantanamo is $445 million, but the officials said the Cuba detention center will need about $225 million in repairs and construction costs if it continues to be used. They said it will cost between $290 million and $475 million for construction at the various U.S. sites, depending on the location. Some of the more expensive sites are on the military bases, which would need more construction. Because of the annual operating savings, the officials said the U.S. would make up the initial construction costs in three to five years. More detailed spending figures, which are considered classified, will be provided to Congress, said the officials, who were not authorized to discuss the plan publicly ahead of its release, so spoke on condition of anonymity. Late last year, other U.S. officials said that the assessments done by the Pentagon team suggested that the Centennial Correctional Facility in Colorado is a more suitable site to send detainees whom officials believe should never be released. Those officials were not authorized to discuss that matter publicly, so spoke on condition of anonymity. Members of Congress have been demanding the Guantanamo plan for months, and those representing South Carolina, Kansas and Colorado have voiced opposition to housing the detainees in their states. "I remain committed to blocking the transfer of Guantanamo detainees anywhere in the United States, especially Fort Leavenworth," Sen. Jerry Moran, R-Kan., said in a statement Tuesday. "We must safeguard the missions on Fort Leavenworth, the nearly 14,000 military and civilian personnel and their family members, and the thousands of Kansans who live in the Leavenworth community." The administration is currently prohibited by law from moving Guantanamo Bay detainees to the United States. Obama has long opposed that prohibition and the White House has not ruled out the possibility that the president may attempt to close the prison through executive action. The plan submitted Tuesday does not address that option, officials said. Opponents, however, say changing the detention center's zip code won't eliminate that problem. On that point, Obama's proposal faced criticism even from those who endorse closing the detention center. His initial campaign pledge was widely viewed as a promise to end the practice of detaining prisoners indefinitely without charge, not to bring that practice to the U.S., said Naureen Shah, director of Amnesty International USA's Security and Human Rights Program. "Whatever the president proposes, even if it doesn't come to fruition, the administration is changing the goal posts on this issue," she said. There are currently 91 detainees at Guantanamo Bay. Of those, 35 are expected to be transferred out by this summer. The rest are either facing trial by military commission or have been determined to be too dangerous to release but are not facing charges. Some can't be charged because of insufficient evidence and some may face future prosecution or have been designated for indefinite detention under the international laws of war. Seven detainees are in the early stages of trial by military commission, including the five men accused of planning and aiding the Sept. 11 terrorist attack, and three have been convicted and are serving sentences. At its peak in 2003, Guantanamo held nearly 680 detainees, and there were about 245 when Obama took office.